It is time for another staff profile! 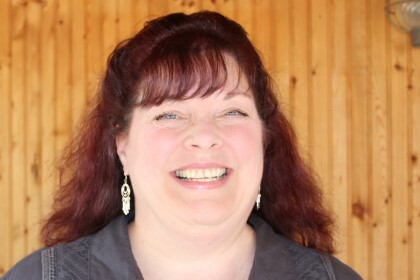 Today, we feature Sheila Allard. -What do you do on campus? I am an instructor in the Communication Skills Department. I teach Creative Writing, English Composition, Speech, Applied Composition, College Success, and Career Development. I also currently serve the department as chairperson. -Where is your favorite place at Western? I love to be in the spots on Western’s campus where students congregate. I’m especially fond of the Union Grind in Coleman because it serves my caffeine needs and the Bistro because I get to see our students shine, while serving some of the best food in La Crosse. When I am not grading papers and hanging out with my family, I have far more hobbies that I have the spare time to manage. I am a poet, a storyteller, and an art quilter, and I also play mandolin and sing vocals in the folk/rock/bluegrass quartet “Magpie Revival”. Don’t be afraid to make mistakes. You will learn some of your most powerful lessons from the mistakes you make, provided you take the time to reflect upon them.